Thousands of people in the Karoo town of Klipplaat have been denied their Constitutional right of access to water for more than a week, with taps in running dry in homes, schools and clinics across the town. What makes it worse, is that the situation was entirely preventable as, despite the drought, there is water. It is simply not reaching the intended end-consumer. I have written to the MEC of Co-operative Governance and Traditional Affairs, Fikile Xasa, to request his urgent intervention, by putting a disaster management plan in place to restore water to Klipplaat. A recently released municipal report on water losses in Dr Beyers Naude Municipality shows that 100% of water destined for Klipplaat is being lost. This is due, in part, to leaks that are never repaired or detected. The report goes on to show that, as a whole, the Dr Beyers Naude Municipality is losing 46.01% of its water, due to leaks. That’s nearly half of all treated water being wasted in the water scarce region in the middle of an extended drought. Water is an imperative for the sustainability of communities. No water leads to businesses closing, which leads to no jobs, and ultimately the death of a town. In fact, it is a Constitutional right that the municipality is obligated to ensure. While the Dr Beyers Naude Municipality have been supplying the residents with small amounts of untreated water that is not fit for human consumption, this is not sustainable. The water supplied is nowhere near sufficient to meet the needs of schools and clinics. Among the affected is the Hobson Khanyisa Primary School with 191 learners, the Brandovale Primary School with 470 learners and the Wongalethu Clinic that serves more than 300 people on a weekly basis. This places children, the sick and the frail at severe risk. No water means unhygienic sanitary conditions, which dramatically increases the risk of contracting diseases. Sufficient monitoring, evaluation and planning by the municipality and provincial government would have meant that the situation the residents of Klipplaat are being faced with, could have been entirely avoided. Only a DA government believes in the supremacy of the Constitution and the realisation of the basic human rights enshrined in the Bill of Rights. The DA will focus on speeding up service delivery ensuring a government that is clean, accountable, transparent and responsible. 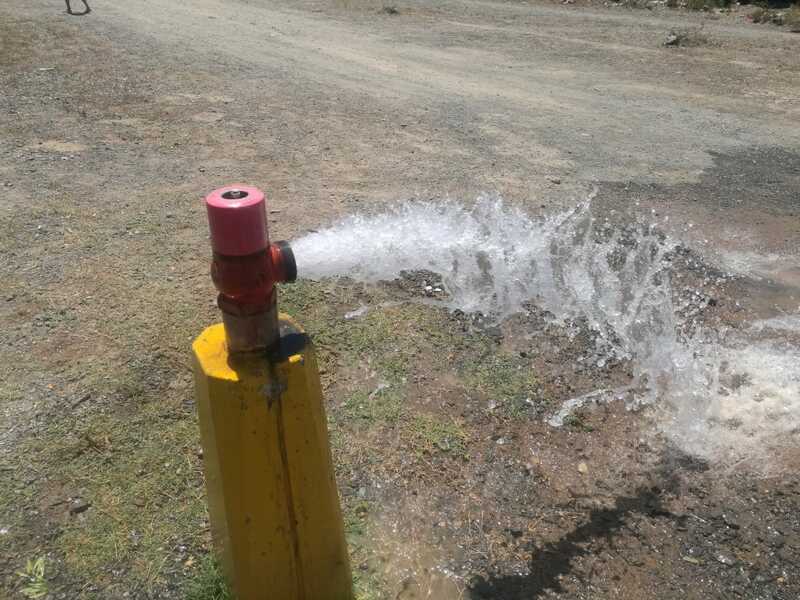 Photo caption: Thousands of litres of water gush out of a leaking fire hydrant in Klipplaat, while taps to schools and clinics run dry.